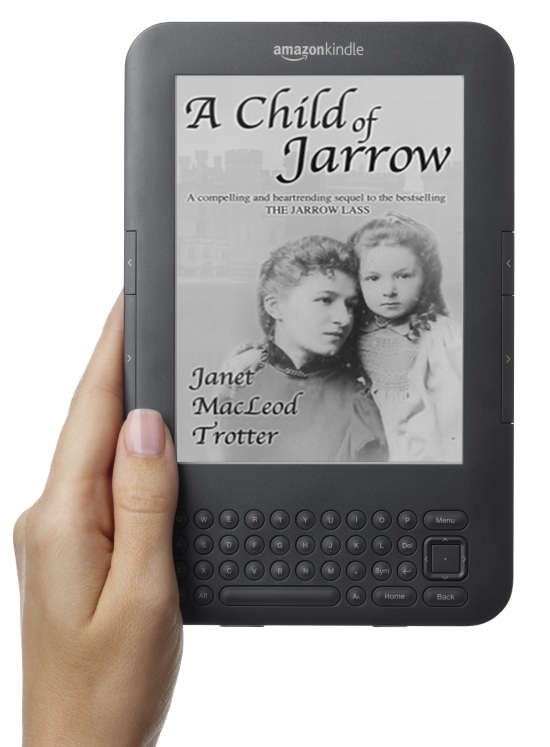 The three books in The Jarrow Trilogy are The Jarrow Lass, A Child of Jarrow, and Return to Jarrow. 1906, The Ravensworth Arms, Lamesley, Gateshead. Kate Fawcett, a barmaid, fell into the arms of a mysterious stranger and conceived an illegitimate child. The child grew up to be Dame Catherine Cookson OBE. Heavy with the shameful sin that a child out of wedlock would bring to her family, Kate agreed that her mother Rose would bring Catherine up as her own. This book tells Rose’s story. The story is set in the 1870s on Tyneside. She is brought up in her parents smallholding in Jarrow but dreams of the world beyond the grime of the town, a world she glimpsed at a fairytale wedding on the Ravensworth Estate during a visit to her grandmother. Marriage brings a beautiful home and a brood of daughters but heartache and poverty are just waiting around the corner. To escape the malign interest of her possessive and drunken step-father, Kate Fawcett is sent away from teeming Tyneside and finds work at Ravensworth Castle. She soon attracts the attention of charming, headstrong Alexander Pringle Davies, a distant cousin of the Earl, who risks incurring the wrath of his family by courting lowly Kate. But when Kate finally succumbs and allows herself to be seduced, Alexander is forced into an unwanted betrothal by his father and disappears abroad. Tyneside, 1923: Catherine McMullen, or Kitty as she is known, is seventeen, restless and rebellious. Resentful of her mother Kate’s new husband, she yearns for stories of the father she never knew. Catherine is sure he must have been special as her mother risked everything for him. But when her gossipy aunt divulges that he was a wealthy gentleman, it only serves to heighten Catherine’s discontent with Jarrow – the grimy, impoverished town she calls home. Eager to catch a glimpse of the lifestyle that might have been hers, Catherine takes a position as a lady’s companion in a grand house. But her illusions are shattered when she realises she has been employed as no more than a skivvy. She decides to try for a job as an officer in charge of the laundry at the notorious workhouse. There her young eyes are confronted with the horrors and indignities of poverty, and she becomes even more determined to rise above her wretched surroundings. Braving the ridicule of fellow staff, Catherine embarks on a quest for knowledge. Soon the ill-educated and streetwise Kitty McMullen is a ghost from the past, and the well-spoken, well-read Catherine leaves the north-east to follow her dreams. But hardship and heartbreak are not far behind, and there are battles to be fought and won before the child of Jarrow finally comes home. “If anyone can claim to be the new Catherine Cookson then it must surely be Janet MacLeod Trotter. Her new powerful saga of a restless, rebellious working-class girl of 17 who experiences the horrors of the workhouse and the harshness of life in service and whose one desire is to escape the impoverished town of Jarrow, is inspired by Cookson’s early life. And her writing, like Cookson’s, can inspire laughter and bring a tear or more likely make you rage at an age when destitution and degradation were considered to be the lot of the common people. This is a story to burn itself into your mind. “Dear Janet OH I am so glad I have found you, my husband has been very ill and YOU have helped me over the last six weeks to take my mind of things, ONLY the dear late Catherine could have done that BEFORE I met you, I have all her books, now you are my new wonder I am telling all my friends about, MOST say OH haven’t you read her before.